If you have set up an auto assignment(either round robin based on active agent or round robin based on active agents with load balance), then you would want to make sure that the agent’s availability is set right. Agent availability is applicable only for agents who are associated to the category which has “Auto assignment” enabled. Note: The Agent can set availability with a toggle only if Auto-Assignments configured is of either Round Robin based on active agent or Round Robin based on active agents with load balance. Each agent participating in auto assignment, must set their availability. In addition to this, agents with 'Manage Agents' permission can also set availability for other agents from the agent list or details page. 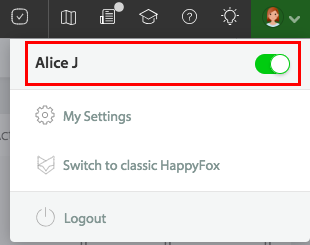 Click on the profile icon to view the status toggle as shown below. Enable to set yourself available for auto assignments. Available indicates that the agent is actively available for the auto assignments and ticket assignments. Unavailable indicates that the agent is unavailable for the auto assignments and ticket assignments. Not applicable indicates that the agent is not associated to any category which has auto assignment enabled. Note: You will not view “Agent Status” column if none of categories have auto assignment enabled. 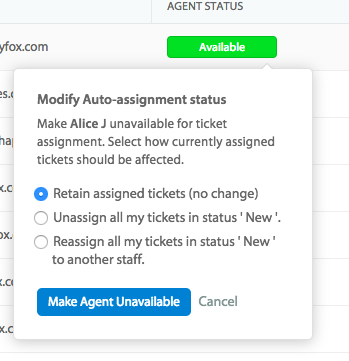 Click on the “Available” button to make the agent unavailable. Retain all the current tickets which are assigned to the agents. Agent’s availability can also be changed from agent detail page as shown below.